Imagine a protest that requires people to wear heavy make-up and take pictures at subway station. Many netizens did so to prevent beauty discrimination, after a girl using dark eye shadow and lipstick was asked to take off her makeup at a Guangzhou subway security check. The movement started after a young woman with the username EIGA-Ziwoxinzhong in Guangzhou, South China's Guangdong Province said on Sina Weibo on March 10 that she was asked to take off her makeup at the subway security check. 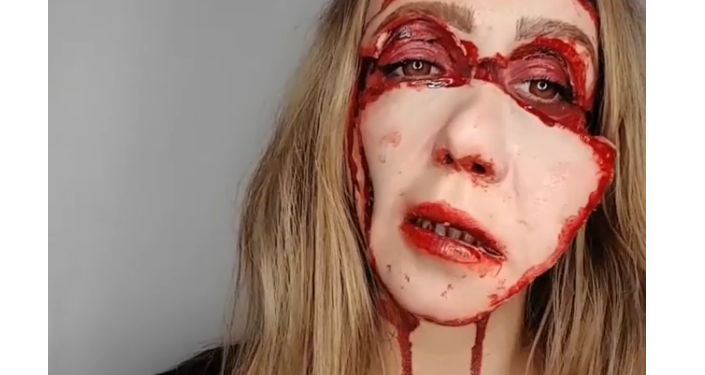 Security check officers allegedly told her that the makeup featuring dark eye shadow and lipstick was "too scary" and "not fit" to use in a subway, she said. The incident sparked controversy, and a campaign was launched to express discontent with the Guangzhou subway's behaviour. Many deliberately put on heavy makeup and showed up at the subway station, and took selfies. Those not in Guangzhou posted selfies using colorful makeup dressed in cosplay outfits. The topic hashtagged "posting selfies for Guangzhou subway" has attracted 5.63 million views as of press time. Stunned by the online accusations, Guangzhou Metro apologized. It said they had suspended the involved official's work and retrained the person in charge that day, and warned the related department not to let similar incidents happen again, Pear Video reported. Some netizens agreed with the officers that the appearance might cause safety risks. Those who support the campaign claimed that there's no law or regulation banning such behaviour. A netizen, "Likoushi," who joined the campaign, told the Global Times on Tuesday that the narrow fixed beauty standard and little tolerance for diversity in public leads to unpleasant incidents. A Guangzhou-based netizen "Zhegerenjintiangelema", who had a similar experience, said that she supports the movement, saying "the subway officials offended the passenger…the movement is to protest against such offences and call for mutual respect."